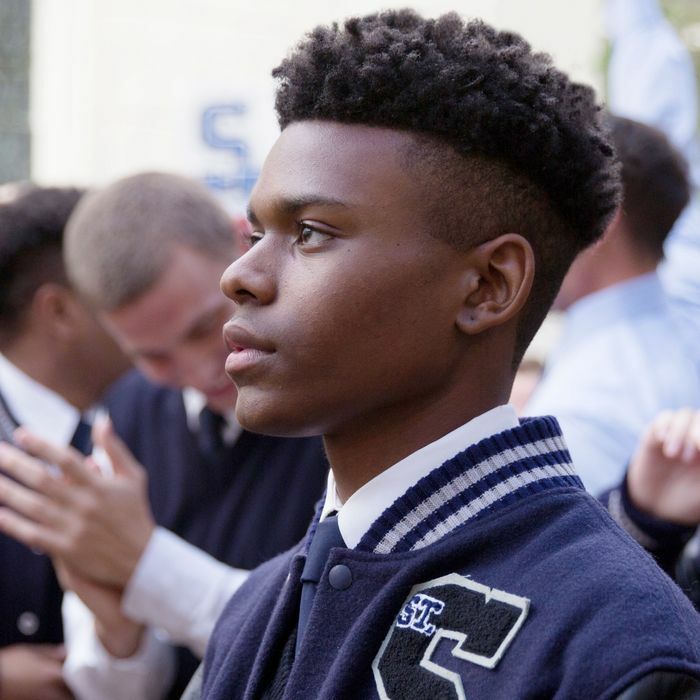 No one can ever say that Cloak & Dagger doesn’t try to juggle its plot lines — for the third episode in a row, we volley across perspectives between Tyrone and Tandy. Sometimes it works. Sometimes it doesn’t. In either case, there aren’t many wasted shots. But it isn’t like we don’t have a stage to work with: with Greg’s death behind her, Tandy’s made it her mission to bring Roxxon down herself. Tyrone’s in pursuit of the crooked cop who killed his brother, going as far as to enter a notoriously racist police department himself. And Detective O’Reilly — the series’s wild card — has started an investigation of her own. Having relocated from the police force on Harlem to NOPD, she’s becoming familiar with the jagged edges of its bureaucracy. The episode opens with a trailer from Roxxon, and segues directly into a shot of Tandy cross-legged in the floor of her church. She’s gathered all of Greg’s research. It looks like she’s coming up with something like a game plan. And, on the other end of that investigation, that image is quickly followed by a cut to Detective O’Reilly — only, she’s not quite, uh, on the job. We catch her in a quickie with a random cop in the parking lot (which, okay). But once she’s finished up there, the next time we see her, she’s actually sitting across from Tyrone in the station. The pair discuss Connors. Tyrone can’t quite put a name on him. When he asks O’Reilly if they can pin his brother’s murder on the cop, she tells Tyrone that it’s impossible. It wasn’t recorded the way he saw it, so, technically, the crime never happened. Once O’Reilly tells Tyrone that “vice cops live separate lives,” Tyrone leans forward and asks if they can’t get Connors on something else. He has a plan — albeit one that isn’t fully fleshed out — but he’s hardly able to explain it before O’Reilly waves him off. She tells Tyrone to leave the police work to the police. Which is fine. We didn’t expect much help from NOPD anyways. O’Reilly doesn’t ignore Tyrone entirely though — later, we catch her checking out the circumstances of Billy’s death. She tells a colleague that she’s noticed a sudden downtown in drug-traffic in the 12th ward, and he tells O’Reilly that the area became significantly safer in recent years: all of the local dealers had fallen out. Now there only seemed to be one major plug. So O’Reilly doesn’t jump on the case, exactly, but it looks like she’s interested, at least. That’s when Tandy also adds that, when she touches people, she can see their hopes. And when Tyrone touches people, he can see their fears. But once Tyrone asks her if that’s a violation, Tandy tells him that the world has always stolen from her. That’s hardly a rare sentiment among heroes in the Marvel universe: what the world took from them, they’ll use their powers to take back. But it’s not as often that you’ll catch that notion from the mouth of a hero, let alone one of your protagonists. And might fall in character for Tandy — but her counterpart has his own problems at hand. When the two-faced white kids on Tyrone’s basketball team buddy up to him, he doesn’t give them much resistance. When he thanks Evita for decorating his locker before the game, she only says, “What are friends for?” And it’s certainly a setback in their relationship, but Tyrone doesn’t have much time to dwell on it: later that day, he’s chatting with his mother about Billy, and the benefits of their respective basketball handles, when our dude suddenly teleports across town, into a random factory. But it turns out that the factory belongs to his brother’s old friend, Wayne. And now, Wayne owns a business! He’s been following Tyrone’s basketball team in the paper! The two talk about Wayne’s been doing, and then they talk about Billy, and before Tyrone takes off, Wayne tells him that the one thing he learned fixing up houses in the city is that you can’t change what was. You can only look ahead. Tyrone takes those words to heart: later on, he meets Evita again, and he offers her a varsity jacket (which, I guess, is how high-school basketballers make their relationships exclusive). Tyrone tells Evita that he “wasn’t ready before,” but he is now. Evita tells him that she doesn’t want him to do something because he feels like he has to. But before Tyrone can can take that jacket back, mumbling, she says, “That’s not what I’m saying”. So, you know, great! Would that this were true for everyone and their significant others. But while Tyrone’s solidifying his relationship, Tandy’s taken that school uniform and flipped it into a gig at the Uniform Charity Gala for Roxxon. This time, she’s running a scam as an Instagram model. She shows up to the gig as “Felicity” from “New York,” with nearly 18,000 followers. And so Cloak and Dagger have a big night ahead of themselves: Tyrone’s got a basketball championship to win, and Tandy has a case to solve. But neither play seems to be working out: on Tyrone’s end, his powers keep getting in the way of the game. First, there’s the officiating, which is blatantly racist. And then there’s the issue of his powers: every time he brushes someone, he sees their deepest fears. And also, he accidentally teleports the ball to Tandy at one point (at the gala!). And also, he accidentally teleports himself to Tandy at one point (at the gala!). But while Tyrone’s struggling on the court, Tandy’s flexing her powers with Roxxon, lightly brushing the gala’s attendees to find more information. She’s having a grand old time until Tyrone appears, suddenly, out of nowhere. Our dude is, understandably, confused. And before he can respond, Tandy pushes him off of a railing — which, uh, turns out to work. Tyrone’s back in the locker room before the end of half-time. But it hardly helps his team — throughout the second half he’s beleaguered between the faulty refs and the fears of his kids he’s playing. When it’s time to hit the buzzer beater, he opts to air-ball the shot on purpose. So there is, apparently, another person that knows the truth about Billy. It’s something Tyrone will definitely want to bring back to O’Reilly, but the next time we see her, she’s sitting with Liam — who is still in jail. When O’Reilly tells him she’s surprised that he hasn’t made bail, Liam says, “Turns out I donated all my cash to an unworthy cause” (i.e., Tandy). But what O’Reilly really wants is information. She springs Liam for the name of a drug dealer in town. When she runs the dealer down, she doesn’t bring her to the police station — but she does get a little info, and a little bit of product, only to post up in the department, the next day, doing a line in the backroom. Connors catches her, thinking he’s doing her a solid, and proceeds to hit the line itself. This warms him up to her since, in his eyes, they share a secret. He tells O’Reilly that they should ride sometime. But it’s apparent that she’s probably just setting the stage to play him. So at least something’s going right for someone. And then there’s Tandy: It turns out that she does find the man she’s looking for. After the gala, Tandy arrives at Peter’s house, looking to kill him, but as she cuts him with the dagger she touches him for his hopes instead — and the sight is hardly reassuring. What it looks like he’s trying to do is steal money. But he’s filching it from the bodies of men he finds on the coast — men that were formerly Roxxon employees. So now, Tandy has a choice to make. Tandy ends the episode back in the church, trying to put the pieces together. And fortuitously, incongruously, we end the episode with yet another name: Mina Hess.